The idea of MetalsCut4U came up when I needed a small piece of sheet metal and I needed a metal fabricator or a piece of metal to buy just the way I planed it. metal to the exact size I really, really needed, because at the store they only had predefined plates. Non of which where close to what I needed. So I went to a local metal fabricator asking about my simple rectangle to be cut just in the size I required. The problem was, the local fabricator did not have time, nor the patients to cut just on piece of my simple rectangle. He said it would not be worth it for him and it would distract him from his other jobs he had to handle. I kept searching for a metal fabricator, and after many phone calls and eMails, I found a metal fabricator who was willing to cut up my simple rectangle and ship it to me. It took him several weeks until I got the metal piece into my hands, but at least I got it just the way I wanted it. He was willing to cut it to my specs and do it just one time at a reasonable price. Needless to say I was happy to have found a metal fabricator to serve an end customer (B2C) like me for only one piece of sheet metal. This is where the idea of MetalsCut4U was born. A metal cutting service for the end customer addressing all the points I had for myself. Thinking how easy it really is to take an order for a specific piece of metal, MetalsCut4U came up with an unique and simple / easy way to order custom cut metal online. The online service is structured in 4 easy steps and guides the end customer, the visitor of the webpage. But we are not only offering simple forms like a rectangle. We have 14 different metal shapes and forms you can choose from. And if that is not enough get in contact with us and send in your drawing, we will have a look at it. 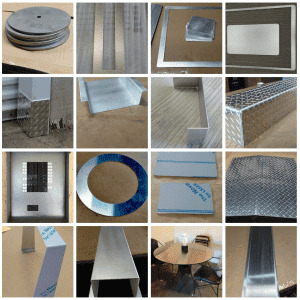 MetalsCut4U is the simple sheet metal cutting online service for you.